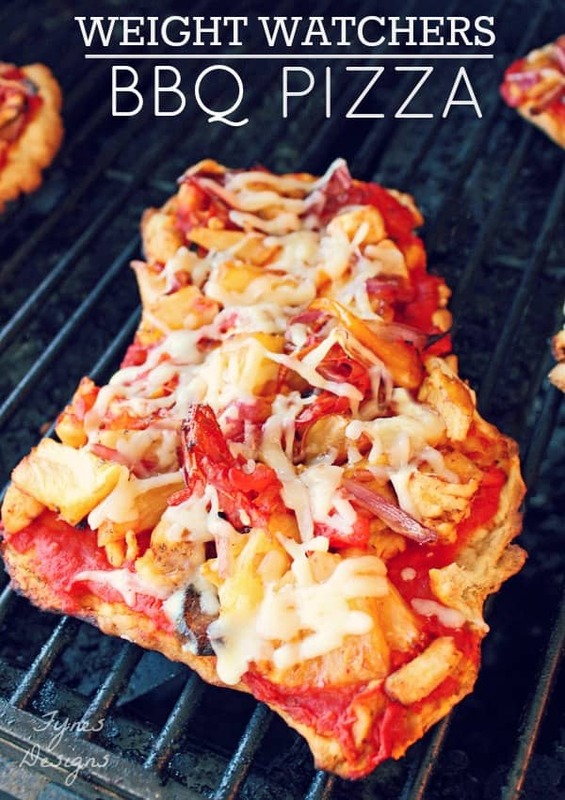 You read right, pizza grilled on the BBQ! I’m sure your first thought is ‘won’t it fall right through the grates?’ because honestly that what I thought. 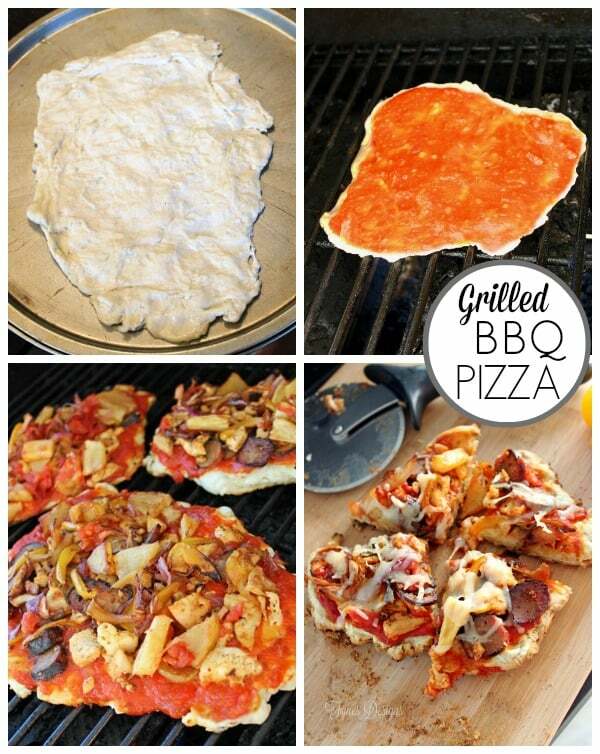 But no, follow these simple directions and you’ll be making BBQ pizza like a pro! During the summer we love to fire up the grill, and try new things. This summer since I’m on plan, I’m trying out lots of new Weight Watchers recipes, and this unique dish is sure to make your guests intrigued and coming back for more! The best part it’s packed FULL of flavour, filling, and pairs great with a variety of low point salads. Mix dry ingredients, and then add water and oil. Stir until it forms a ball. If dough is stiff add a small amount of additional water. Knead with oiled hands for 3-4 minutes. Break into smaller balls and knead flat on an oiled cookie sheet. Depending on the amount of balls you make, changes the point value of your pizza. Each ball will be an individual pizza. 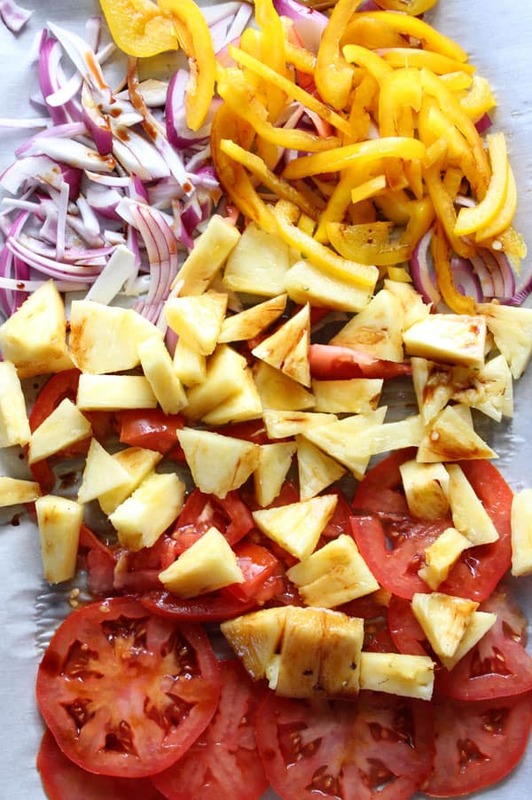 On a parchment lined cookie sheet roast your pizza veggies and fruit in a 400 degree oven for 45 mins. I like to use tomatoes/ cherry tomatoes, pineapple, sweet onion, mushrooms, and peppers. If you’re having company and want to be ready to go, this step can be done in advance (but should be reheated before taking to the grill). Heat the BBQ on high for 5 minutes prior to making the pizza. The preheat will also burn off any previous BBQ business, be sure to give it a scrape. Allow your pizza to grill for 10 minutes on low heat, pizza is done when sauce is heated through. I haven’t really figured a good way to test this other than sticking my finger into the centre. Add cheese about 1 minute before removing from the grill. 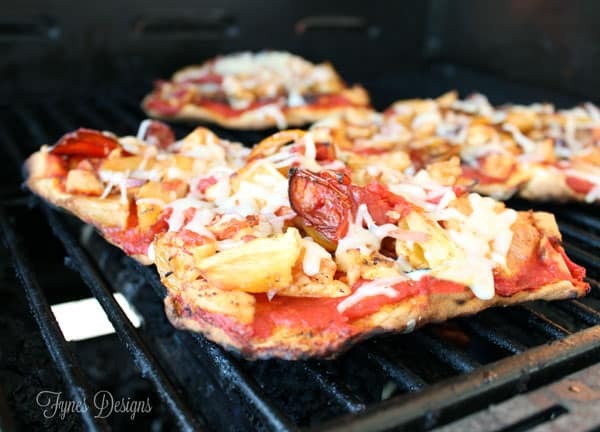 This grilled bbq pizza is crispy on the edges. The roasted veggies make it a bit sweet. Use a pizza wheel to cut your pizza into triangles. They can be served as a main course or a low point appetizer. 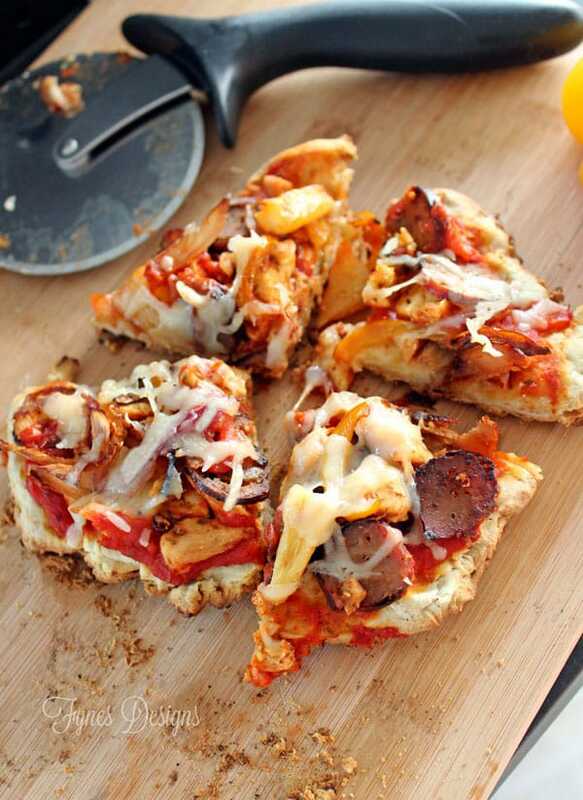 The above pizza is 8 points with veggies, sausage, and cheese. 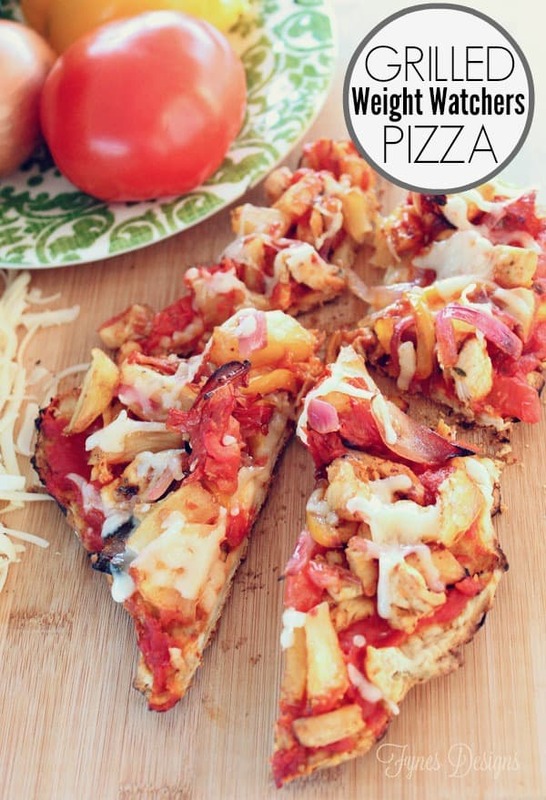 A veggie pizza (which I like) can be as low as 4 points, or only a 1 point Weight Watchers appetizer!! 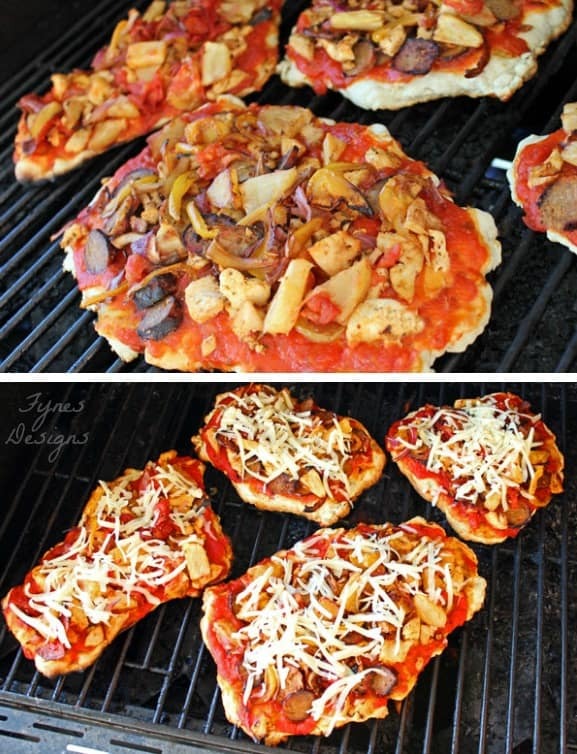 What do you think, will you try this Grilled BBQ Pizza Weight Watchers recipe? It’s a delicious treat sure to impress your guests! I hope you have a wonderful weekend, and a chance to fire up the grill! Curious about How to get started with Weight Watchers? Or maybe you’re looking for some low point snacks? Yummers! This looks awesome, Virginia! Delish! How are you doing? I’m having a hard time with the summer festivities but trying to stick with the plan the best I can! I’ve had to make a few visits to the city, which meant eating out. This can be a challenge to stick-to-the plan. But I’m doing well, I am within my goal just need to lose a few more pounds. Keep up with the delicious recipes – I love your blog! Thanks Anna, I feel like the whole summer is like that for me, just this past weekend I had a tupperware party, a potluck, and a birthday party. Hard to keep focus around all the delicious treats… but I’m plugging away! Congrats on being so close to your goal! What a nice dish for grill party. Thank you for sharing the recipe!